Try our Bariatric Exercise Program here at Griffin Hospital. The expert staff will guide you and explain everything to make you feel comfortable and in control. Meet other weight loss surgery patients who share your story and who will motivate and push you to reach your goals. Not only will you be part of a great exercise program, but you will also be getting the support from other patients – all this while having a great workout! Sometimes, we all need to let it out. Use your negative energy and channel it into something positive that keeps your heart pumping! Try sports such as boxing, self-defense or martial arts and fencing. 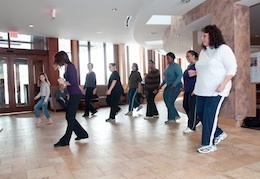 Most centers offer beginners classes and free trial classes. And you will not have to spend a fortune on gear – most equipment is available free of charge by the centers. Spring has sprung, which means that we all want to spend more time out of doors. Make great friends with your neighbors by offering to walk their dog if you do not have your own pooch or join the Griffin Bariatrics walking group that meets at the Riverwalk in Ansonia. Feeling a bit more adventurous? Now is the time to inquire about rowing clubs in Connecticut. Many clubs welcome beginners of all ages for their rowing classes and promise a wonderful workout on one of the Connecticut rivers. Consider things that you loved to do as a child, such as roller skating, hula hooping or jump roping. No need to buy your own skates if you skate indoors at one of the roller rinks – they have skates to rent. If hooping is more your style, try out a class at a local community center to get your groove on. If you are crafty, you can also make your own hula hoop (nothing is more motivating than a sparkly hula-hoop). Adult jump ropes can be purchased at most box stores for around $15. It is a quick and intense workout and sure to recall fond childhood memories. Pain can take all the fun out of exercise. But not to worry, where there is a will there is a way. Water is your friend! Contact Dr. Ehrlich regarding their water-Zumba class or check your local community center pool for water exercise classes. It may look like fun, but be prepared to burn twice your body weight in calories in an hour class! For more information on our bariatric surgery program, please contact Kim Fisher, Bariatric Care Specialist, at Griffin Hospital or register for a free seminar or support group on our site.